The new iTunes interface can be a bit jolting at first, but whether you’re still trying to get the hang of the new iTunes 11 interface of you’ve already made the changes to bring some familiarity back to the app, you’ll find good use out of these keyboard shortcuts. We’ve split them up into three distinct sections based on usage, and you’ll be able to start and stop songs, change volume, hide and show the sidebar, toggle the new MiniPlayer, and access all of your media libraries, all with the help of nothing but some simple keyboard shortcuts. You’ll notice that some of the media library keyboard shortcuts won’t work if you don’t have anything stored in them in iTunes. For example, if you have no iBooks available in iTunes, then hitting Command+6 won’t do anything. This post was inspired by MacGasm, who listed a handful of the keyboard shortcuts that let you quickly jump around media libraries. Are we missing any other useful keyboard shortcuts? Let us know! Good tips. Unless I missed it you forgot the Command+L to go to the current song playing. This is useful to jump to that playlist or if you can’t remember where it was. Will we ever see “show duplicates” or the album art of the selected song (not the one playing) in the bottom left corner ever again? Very useful indeed, and as mentioned before: command+L is the one I use most of the time. As is Command+I; which let’s you change settings, System wide shortcut btw. 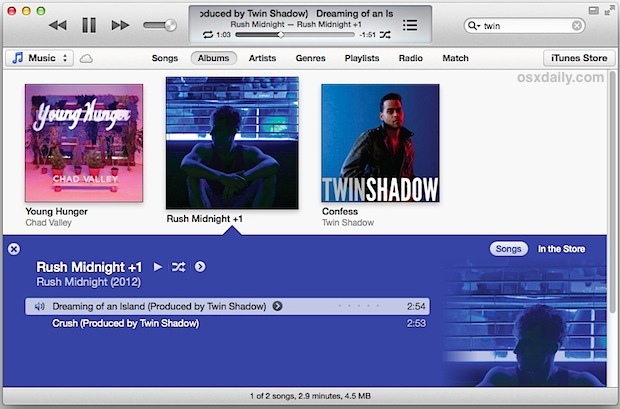 Show selected song (not necessarily the one playing) in a new Finder window. I am looking for a shortcut to check/uncheck the song … Any one knows? ?